NIGHTSKY BEQUEST started back in late 1994, when the band founder Andre Mateew began to look after some musicians who can help him record the demo he had been thinking over and over again for quite a long time. 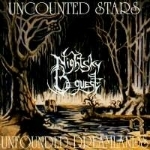 So the band recorded the demo “Uncounted stars, Unfounded dreamlands” in june of 1995. In it were included an intro, 3 songs and an outro, in an avantgarde version of dream-doom metal, which, a few months later NIGHTSKY BEQUEST performed live. The material from this live-show called “Nightflowers Destiny” was released on cassette and sold out through COUNTER ATTACK Productions. In the meantime their demo “Uncounted stars, Unfounded dreamlands” was well accepted by the pressed and was released as a MCD by the Italian label Polyphemus Records. The next step for NIGHTSKY BEQUEST is the full-length album “Keep the Lonely Trees” which is released by COUNTERATTACK Productions on CD. The album has already received quite positive feedback abroad (reviews in the most relevant major Metal Hammer, Rock Hard, Close Up, etc. and underground press) and the proof could be found numerous interviews in different magazines: GRINDZONE, TRANQUILL CHAOS, LEGION, VAE SOLIS, COUNTER ATTACK, FREEZING FLAMES, BRUTALLICA and more true underground magazines. The success is due to the innovating style the band has chosen, boundaries and cliches are left far behind because the harmony between music and lyrics creates an unique illusionary desertof dreams and emotions. Maybe it’s “what you see when you look into the crystal waters, but what do you see when you try to engrave the happiness upon them...?”. “Of Sea, Wind and Farewell” is the album NIGHTSKY BEQUEST have been striving to reach to for such a long time. It’s recorded and mastered in one of the best studios in Eastern Europe (Graffitti Studio) where its exquisite sound has been achieved. In the autumn of 1998 NIGHTSKY BEQUEST have signed a contract with X-RATED Records (Mexico) for the releasing of the new album"Of Sea, Wind and Farewell" on CD. It accentuates on the delicately balanced harmony in the music so the listener could relish the varied combinations of acoustic guitars, synths, flute and all other necessary instruments. The two elements however which give NIGHTSKY BEQUEST its real face are Radoslava’s calm voice and Andre’s poetry. where desires have no meaning, where life is past and distant future, where life has no material significance and there’s no actual reality. - Nightsky Bequest - you wouldn’t wait the dawn to come - touch the night together.